Trying to find a silver lining after people vandalize Wakamow Valley Authority (WVA) is hard but there is a ray of sunshine in the most recent act of stupidity. A Moose Jaw firm, Acott Plumbing and Heating has kindly offered to repair the most recent incident, which totalled about $2500 to $3000. "Acott Plumbing has offered to fix it for free. That's something that does not happen to us too often," Margaret Moran, CEO for Wakamow, said. 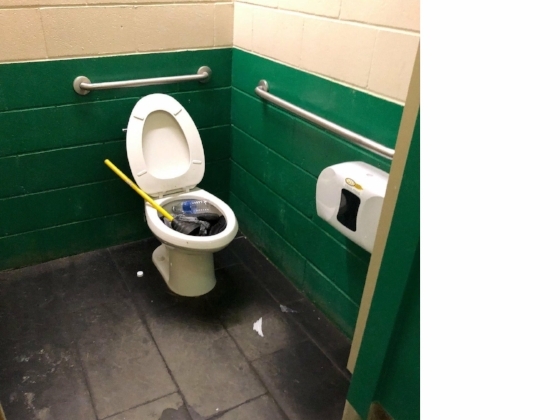 This past Tuesday, June 5th, between 5:30 and 8:00pm a person or persons entered the washrooms in Kiwanis Park and, using a log, destroyed two urinals, then plugged the toilet in the men's washrooms before smashing one toilet and plugged two more, in the women's room. "It's very disheartening for Wakamow and our staff who work so hard," Moran said, calling it "an unwarranted and reckless act." "I try to portray Wakamow Valley as positive as possible as most people are good." Due to the fact the washroom fixtures are commercial quality they had to be ordered and the repairs will not be completed until this Monday. The washrooms have been temporarily closed and replaced with chemical toilets. She was surprised it happened during daylight hours but because it is a washroom people cannot see inside of it, and therefore understands how it happening in the daytime is also possible. Additionally, it is a "very, very busy park" with the skating oval, dock as well as Pirate Playground nearby. "I'm just hoping...whoever did it...they have remorse for inconveniencing others." Wakamow tries to fight vandalism and theft by being active in watching for it but she admits "we can't be everywhere 24 hours a day." "If we could figure out why people do this we could take measures to prevent it." Moran asks that park patrons also call police if they spot vandalism and theft. "It's your duty to report these incidents to police, you are not snitching." "It's about respect for other people's property. Public property belongs to everybody." She also warns people; for their own safety to report incidents of theft and vandalism to the police and don't attempt to confront people; so you are not harmed. The police are trained to deal with these situations. Although vandalism and theft are not widespread, they still happen. Some common occurrences being graffiti, destruction of trees and plants plus theft of decorative rocks. "If the graffiti is offensive we will go down there and cover it up right away." Vandalism has also been a problem in the past but usually it happens at night. In 2016, an outdated wooden playground was partially destroyed by arson. It was replaced by a $120,000 state of the art playground that is wheelchair accessible. Vandalism hits Wakamow hard, especially since the Province cut $157,000 in funding to WVA. Vandalism takes away from doing necessary upgrades but it's tougher with reduced funding.